Grilled Herb Chicken, Swiss Cheese, Bacon, Avocado, Lettus, Tomato and Ranch Dressing on your cho..
Fried Grouper ,Shredded Lettuce, Tartar Sauce, Lemon ..
Grilled Chicken, Brie Cheese, Apples, Arugula W/ Apple Cider Dressing .. Beef Brisket, Grilled Onion, Cream Horseradish ..
3 Eggs, Peppers, Onion, Tomatoes, Mushrooms, Swiss Cheese .. 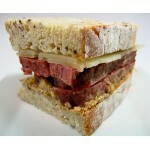 Hot Corn Beef Brisket, Swiss Cheese, Spicy Mustard .. Beef Pastrami, Swiss Cheese, Mustard and served with Pickle and Potato Chips. ..
A cheese steak sandwich is not really a steak at all – it is a sandwich made with chipped steak,&..